Imagine being grabbed by an angry mob who then threatens to kill you, puts you on a mock trial, and then finally ties you to two logs and shoves you in the Missouri River. And all because you believed that slavery wasn’t right. That is one of the defining moments in the life of Pardee Butler. This pioneer preacher, while best known for his work as an abolitionist, was a very active Christian. He planted many congregations in the Kansas territory (before it became a state). He preached for most of his adult life, and wrote many articles during that time. This book is the ultimate Pardee Butler collection. Just look at the works that are included, and you’ll know why. This work, graciously provided by the Kansas State Historical Society, looks at the life of Pardee Butler as he fought against slavery and saloons. And in Kansas, he won both fights. This article was written for publication in answer to personal attacks made against him by his own brethren. These attacks were made by the leaders who thought the best tactic to take in regards to slavery is to just not bring it up. Of course, those brethren refused to print it, so Butler published it himself. This is part autobiography, part history, and every bit of it interesting. Read his personal account of being “rafted” down the Missouri River by an angry mob. See how the same mob later tarred and cottoned him (they didn’t have feathers). But even more than that, You will see his incredible love for the truth and care for the churches in Kansas. This is the “final word” on Pardee Butler, written by his son, Charles P. Butler. It gives a very balanced look at his life and shows that he was much more than an abolitionist. 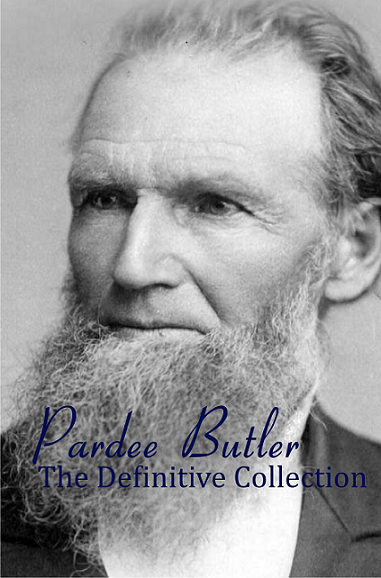 I am currently writing about Pardee Butler’s influence and activities in my hometown and region in western Illinois. He had planned on living in Mount Sterling Illinois for a few years before moving to his Kansas farm first, but other plans emerged. My hometown of Quincy, Illinois had a very large abolitionist/Underground RR network that included former slaves during the time Butler preached here, but it remains unknown if he was aware of it.